It should also be noted that the wishlist is always going to be longer than the features list. A LOT of Wishlist items have made it into the software since I started using it. But, there are also contradictory wishes. 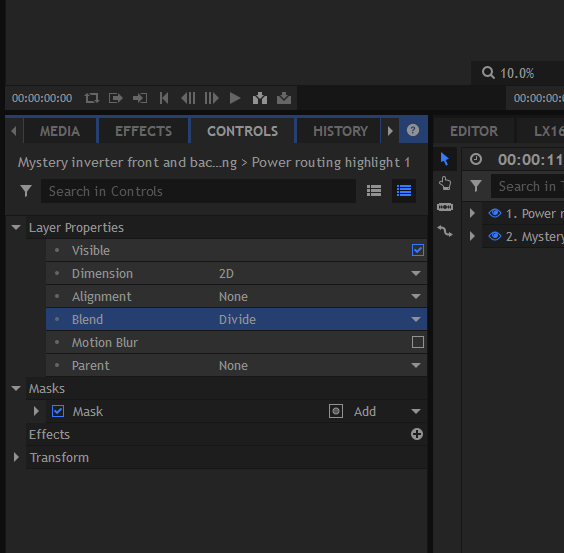 Example, 3D navigation was changed in Hitfilm 4 Pro to match user requests. With Hitfilm 2017 there are wishlist requests for changed 3D navigation. No matter what, someone will be left unsatisfied. Yep. All software have their own workflows. Many times people approach software like gamers approach games. A lot of gamers want changes to the game that suit their personal play style. And those changes often dramatically affect the play styles of other gamers. The same goes for software. Some people like the workflow of After Effects over Nuke. No matter what app you choose, you will always have to adapt to some extent to the workflow of that app. Why? Because 10 is just an arbitrary number that isn't actually very useful. If you're setting keyframes - of any sort: masks, animation, rotation etc. - then you'd hope to be able to skip forward by a large(ish) step to avoid doing it on every frame. But, if you need finer control on a few places, you might have to halve the distance. Then if even finer control is required: halve it again. So 8 frames, 4 frames, 2 frames, 1 frame. Easy. With steps set at 10 you go to 5 frames, then uh...2.5 frames? Then 1.25 frames? Better still, make it editable, because sometimes you want to set in/out positions for Opacity fades, Scale zooms, whatever, at n frames from 0-100% etc. and if you do that more than you set keyframes for other things: you might decide you'd like that at 7 frames. Or maybe some other amount that equals 1/4 of a second, or 1/2 a second, depending on the project playback properties. So if 30/29.97 fps, maybe steps of 15? 10 frames isn't much of anything helpful at any video speed. tl;dr: 10 frames isn't a nice multiple of much in video frames. Changing it to almost anything else would make it more useful, but if it can't be editable, then 8 is the most versatile number. I would love the ability to transcode to prores (or DNxHD or Cineform), right from the aplication ala Final Cut and Davinci Resolve. I'll +1 what @Palacono listed with a modification. Make Shift +/- jump by a preference which is a fraction of second jump. Rounded to nearest whole frame. Let it go from 0 to 1.0. 1.0 being a one second jump. Controlled real time jumps of the playhead are more important than specific frame counts, IMO. The number of frames being variable for a wall clock time jump depending on the timeline frame rate. So HF has a Shift +/- shortcut. Also add Ctrl+Shift +/-, Alt+Shift +/-. Or just go with Ctrl +/- and Alt +/-. Shift +/- would be the preference setting. The extra Ctrl modifier would be half the Shift +/- time. Alt could be 1/4 the preference. Something along those lines. Or for backwards/legacy compatibility keep the Shift +/- and add new shortcut(s) with described function. Moving through the timeline by seconds makes sense as an Editor. Depending on the action, key framing can be done at the beginning and at the end of the shot. Followed by key frames in between to match the subject. I think the key is to be able to set the "jumps" by timecode or by frames, along with the length of the jump. The way I look at it moving really short amounts is easy by just pressing the single frame move shortcut a 2,3,4 times. Then there are times you want to jump a distance and that will be something specific. I have spent time in Vegas whacking the frame move command counting in my head 1,2,3,4,etc to my target count which was often a time distance. Having a way to program a custom move, frames and/or time, would be convenient workflow and less wear and tear on my keyboard and my fingers. In Nuke, there's a field under the viewer where you can type a frame amount to control how many frames you can jump at a time. To use it, you hold down Shift and tap the left or right arrow keys to make jumps through the timeline based on the number you enter in the field. It would be great to have such a tool in Hitfilm. @ToddGroves It makes sense at least someone offers a custom jump feature. I'm a hack nobody and given how little I have done, even I could have used such a feature for more efficient workflow. The basic assumption being that someone who does more could find use of said feature more than me. The fixed 10 frame move thing is probably an idea FxHome got from AE/Premiere. They copy them a lot. There is logic in that copying, given the base of Adobe, but it saddles you with someone else's workflow. I also find it kinda wierd that the 10 frame move is on the +- keys with a shift modifier and the frame move is on the ,. keys without modifier. Why is the 10 frame move not a shift modifier of the ,. keys. Things that make you go hmmm. It is way more difficult to press Shift +- with one hand and your hand has to move away from the ,. keys. At least the shortcuts that we have can be reprogrammed. With such a shortcut change an 8 frame move is only three shortcut actions with no hand move. 10 - 2 = 8. I don't know how to code software, but I hope we can alter the timeline jumps in the future. It would be a great tool for both vfx and editing. Unless I'm misunderstanding, it is. Previous frame default shortcut is , and jump back 10 frames is Shift+,. Are you suggesting we swap the two for the default shortcuts (other than the configurable jump)? @CedricBonnier Aw hell. Foot in mouth. My apologies. I was flapping my lips based on memory which is obviously faulty. Maybe something changed in HF (very unlikely), maybe something quirky happened in my installation back in the HF3 days (low %), maybe I was hallucinating (highest %). I only remember something irked me in use way back and I have been changing shortcut(s) reflexively without looking or thinking since. @Bry_man you can add another pair of tracking points after a long break in tracking, apply those to a second point, then parent the first point to that new one. That way the new points will continue to affect your camel when it comes back on screen. The jump frames number would be better be configurable so people can set it for whatever video arrangement they work with. I came here to wish that the compositor would let me scroll up and down and left and right using the mouse wheel with Ctrl or Shift or Alt (ideally configurable to match all the other programs I'm used to using). Are you talking about the Viewer panel? If so you can right click to pan the view. @THX1139 to semi devil's advocate here, one key thing you wrote (and it's kinda what everyone writes) was "ideally [identical to] all the other programs I'm...using..."
I agree but I think the solution everyone seems to miss for some reason is to just make the feature user configurable. This applies to so many features that people squabble about as though software was an injection-moulded product which couldn't be user-configured once it left the factory. @THX1139 I shudder at the time and cost needed to make every feature in an interface user-configurable. I wouldn't want to be the one to design the screen for switching side scrolling in the viewer timeline from right-click+drag to CTRL+MMB. Triem23 I don't think that each option should have its own screen. All the configurable inputs should have one interface to set them in. It's a better system than changing things for one person and then changing them again for another, all the while satisfying no-one :P Incidentally, I don't want to switch side scrolling from rightclick + drag to shift + middle mouse scroll; I'd rather have both work! I'm adapting to Hitfilm's workflow because I think it's worth learning. Although I would like to be able to adjust the "frame jump" number. I wish to be able to draw freehand planes. I think that would be easier than doing a regular plane and then doing freehand masks. I wish to be able to use the up and down arrow keys on the keyboard to change the selection in a dropdown box without using the mouse. You can do this in GIMP to quickly see and compare the effects of the different blend options. I don't see how creating a custom plane with a mask without a plane in place saves a lot of time. You still have to create a layer to hold the mask. What exactly are you trying to accomplish? A fisheye/spherical camera to render 180/360 videos (2048x2048)! The technology has arrived, let's make use!!! Forgive me if this suggestion is repetitive, (there sure are a lot of pages in this thread) but what about a value randomizer that serves a similar function to the "wiggle" expression in AfterEffects? The Shake effect is top-notch for camera shake, but being able to generate random values for other things (flickering 3D light intensity, etc) would be super-useful. I think one item that could be configurable at some level would be, what does the mouse scroll wheel do in a given pane. It would still be limited to 2/3 fixed choices which of course will never satisfy everyone. For example in the NLE. The scroll wheel could scroll the video/audio sub-pane up down (current use), scroll the timeline left/right in time (current Alt+wheel), or zoom in/out (current Ctrl+wheel). I'm requesting a feature that will easily show which layers in a composite shot are currently being used in the scene. The behavior would appear as follows: As you scrub a composite shot, the layers that have images/effects/transitions contributing to the frame would highlight or change their tint slightly. It would serve as a map, of sorts, so you know where to look if something needs to be tweaked. At times, my composite shots have more than 30 layers -- it would be great to know which layers have images or settings currently in use.